Dutch trio Dewolff have added more dates to their forthcoming Australian tour including Byron Bay and Manly’s Old Boatshed. To celebrate, Goset Music is releasing their accomplished new blues-rock album, Dewolff IV on 8th March! This #1 album in the Netherlands (and Top 10 in Italy) marks the success of a young band with a growing live reputation, recently earning them Europe’s Must See Live Band tag by Rolling Stone. To spoil Australian audiences even further, Goset Music will now release DeWolff’’s recently announced back catalogue of albums; Strange Fruits and Undiscovered Plants (2009) and Orchards/Lupine (2011) in a special double album Australia- Only edition. The band’s first album was written and recorded when the average age of the band was just 16. That’s three albums released in one day in Australia! Dewolff IV is a feast for the upper astral psyche, a manifest of genuine space rock. Featured on this double sided musical compendium is the 20-minute, seven volume opus, A Mind Slip, full of higher dimensional swagger, exotic wave modulations and mojo. 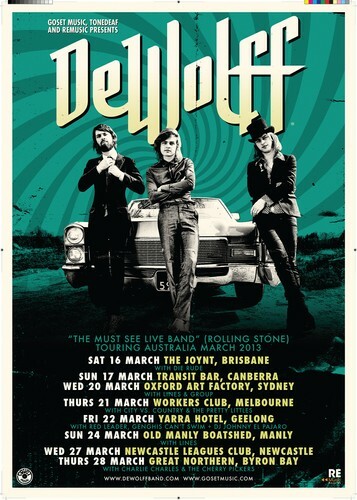 Dewolff has been electrifying stages throughout Europe - they are energetic, passionate and damn loud and now they unleash their Hammond organ fuelled brand of rock down under with a national tour in March 2013 - so lock up your daughters!